Turkmenistan Boxing Federation is aiming for at least one medal in the upcoming ASBC Asian Confederation Boxing Championships which will be held in Bangkok, Thailand from April 18. Their best boxers as Hursand Imankuliyev and Nuryagdy Nuryagdyyev have got the potential to win a medal in the continental event. Eight boxers have been selected to the team from the bantamweight (56kg) up to the super heavyweight (+91kg). 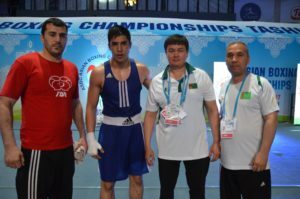 Turkmenistan won its lone title in the history of the ASBC Asian Confederation Boxing Championships in Zhuhai in 2009 when Serdar Hudayberdiyev won a historical gold medal. Since then Turkmenistan earned medals in the recent editions of the ASBC Asian Confederation Boxing Championships. Turkmenistan sent boxers to the Makran Box Cup to Chabahar, Iran and to the Great Silk Way Tournament to Baku, Azerbaijan which were their preparation events before the ASBC Asian Confederation Boxing Championships. Yazmyrat Gurbanov moved back to the bantamweight (56kg) and defeated his main national rival Islamic Solidarity Games silver medallist Yakub Meredov in the final of their National Cup which was the main selection competition. Hursand Imankuliyev won the gold medal at the Feliks Stamm Memorial Tournament in Warsaw, Poland last March which was his breakthrough in the elite age group. Following his successes over top Russian boxers he advanced to the last eight in the Jakarta 2018 Asian Games and he is planning to get at least a medal in Bangkok. Togrulbeg Pazzyyev, who came from Turkmenistan’s most famous boxing family, attended in the Sofia 2014 AIBA Youth World Boxing Championships and he needed a few years to be selected in the elite level. Shokhrat Durdyyev competed at the Incheon 2014 Asian Games but since then he moved up to the welterweight (69kg) and the Bangkok event will be his great comeback to the team. A returning middleweight (75kg) hope, Nursahat Pazzyev was Olympian boxer in London seven years ago and he is the lone boxer in Turkmenistan who claimed medal in a Youth Olympic Games. Nuryagdy Nuryagdyyev was silver medallist at the 2016 ASBC Asian Confederation Youth Boxing Championships and achieved quickly bronze at the Tashkent 2017 ASBC Asian Confederation Boxing Championships. In the absence of Islamic Solidarity Games winner Arslanbek Achilov, Shatlyk Saryyev will be boxing at the heavyweight (91kg) and represents Turkmenistan at the very first time. Baky Toychiyev was Youth National Champion in 2016 and involved to the elite squad two years ago at the Islamic Solidarity Games.